The Mt. Elgon ecosystem straddles eastern Uganda and western Kenya. Resident communities are particularly vulnerable to climate change due to rapid population growth and a strong dependence on the mountain’s natural resources. To help local communities better manage the declining water supply, our project is advancing work to restore catchment areas, including riverbank rehabilitation. Our Ecosystem-based Adaptation (EbA) solutions will also help bring water from the River Sipi closer to mountain communities, drastically shortening the long distances women and children have to trek to fetch water. The Mountain EbA project in Uganda is building upon the ongoing work with communities in the Mt. Elgon National Park Landscape. The Mt. 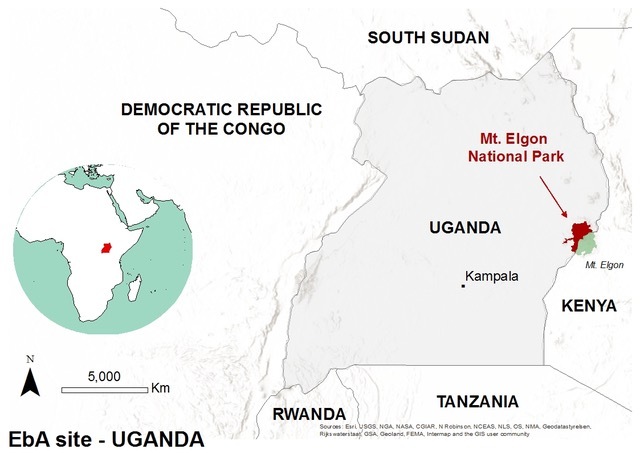 Elgon ecosystem covers an area of about 772,300 hectares—the higher, forested slopes are protected as National Parks both in Kenya and Uganda. This ecosystem serves as a catchment area for the drainage systems of Lakes Victoria, Turkana and Kyoga. Water quality and quantity in this area are essential for mountain communities whose livelihoods depend on a healthy ecosystem. From western Kenya and eastern Uganda to the wider Nile Basin, mountains are a source of water, fuel, timber, fiber, traditional medicine and food, as well as handicraft and building materials. Mt. Elgon communities are dealing with degraded land and depleted forests. Some wetlands and forests are now farms, and some riverbanks are being cultivated. Overharvesting of forest products and encroachment by settlements and agriculture are key threats to these forest ecosystems and have lead to landslides and floods. 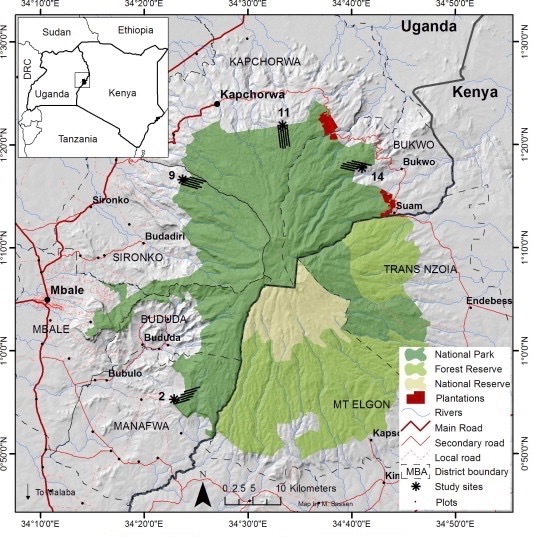 The Mountain EbA project will use lessons learned from previous work in the Sipi Catchment area to better support interactions between the communities and the National Park. In partnership with the Kapchorwa District Local Government, the Uganda Wildlife Authority, local communities and local experts, we are working to understand the impact of climate change on mountain communities in this area. Baseline indicators and a framework for monitoring and evaluation is the first step. With this scientific foundation in place, we can work in close partnership with communities to identify, prioritize and develop adaptive solutions to key challenges they face. Our goal is to achieve healthier, local ecosystems and greater resilience in Mt. Elgon communities. Learn more about our Mountain EbA projects in PERU and NEPAL. The official name of our program is “Scaling Up Mountain Ecosystem-Based Adaptation: building evidence, replicating success, and informing policy”. This program is part of the International Climate Initiative (IKI). The Federal Ministry for the Environment, Nature Conservation, Building and Nuclear Safety (BMUB) supports this initiative on the basis of a decision adopted by the German Bundestag. Our Scaling Up Mountain EbA Program is led by The Mountain Institute (TMI) and implemented jointly with the International Union for the Conservation of Nature (IUCN) and country partners over the period 2017-2020.